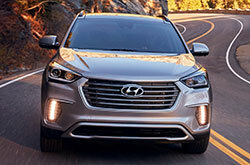 The Hyundai Santa Fe lineup offers options for all sorts of SUV shoppers, with a larger three-row midsize SUV body style and two-row compact crossover known as the Santa Fe Sport. 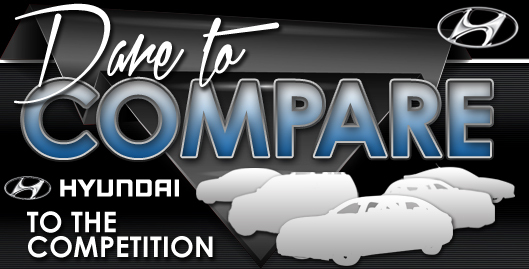 You can find the right sized utility vehicle for your needs, and get the sporty looks, affordable pricing and next-generation safety features that you desire in a crossover SUV. Check out our 2018 Hyundai Santa Fe review for details. If you're shopping for a 2018 Hyundai Santa Fe in Springfield, MO, you've got several trim options to choose from. The standard three-row Santa Fe is offered in SE, Limited, SE Ultimate and Limited Ultimate trims, while the two-row model is available in base Sport, Sport 2.0T and Sport 2.0T Ultimate trims. New this year, the Sport adds a brand-new Value Package that includes power windows with auto up/down, heated dual-power side mirrors with turn signal indicators, and a proximity key with push-button start, as well as remote start with the BlueLink app. 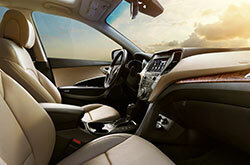 In addition, Santa Fe and Santa Fe Sport models with leather upholstery now include standard wood-finish trim. BlueLink services are also now included for no charge for three years. Other notable standard features include dual-zone automatic climate control, a 12-volt power outlet, steering-wheel audio controls, Bluetooth Hands-Free Phone, HD Radio and Android Auto. All three-row models are equipped with a 3.3-liter V6 engine that produces 290 horsepower and 252 pound-feet of torque. A six-speed automatic transmission with SHIFTRONIC is standard and there's a choice of front- or all-wheel drive. If you're interested in the Sport, it offers a 2.4-liter four-cylinder that makes 185 hp and 178 lb-ft of torque. There's also a turbocharged 2.0-liter four-cylinder on the Sport 2.0T that makes 240 hp and 260 torque. When you stop by to test drive a 2018 Hyundai Santa Fe in Springfield, feel free to try all engines! 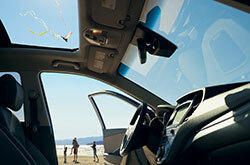 The Santa Fe lineup includes numerous safety features to keep you and your passengers protected. 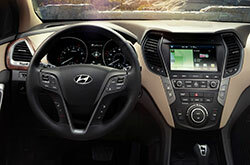 Along with stability and traction control, hill start assist, tire pressure monitoring and ABS, the Santa Fe and Santa Fe Sport are standard with a review camera and the BlueLink emergency communications system. Several models can also be had with technologies such as blind spot monitoring with rear cross-traffic alert, frontal collision mitigation and lane departure warning. 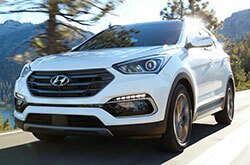 Continue our 2018 Hyundai Santa Fe review to learn more about the lineup! Also, schedule a test drive or simply stop by our dealership off Chestnut Expressway and Ingram Mill Avenue during business hours. 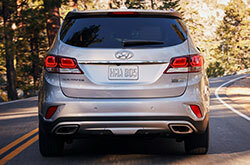 When searching for new car models in the Springfield metro area, you may have seen the 2018 Chevrolet Equinox, Ford Explorer, Mazda CX-9 and the Toyota RAV4, but the 2018 Hyundai Santa Fe is also a phenomenal option. Due to its features, winning design and inviting persona, it could be just the vehicle for you. Take advantage of data listed in our review to see if the 2018 Hyundai Santa Fe fits your needs and budget, then check out Hyundai financing offers online! Find lease offers on the acclaimed Hyundai Santa Fe at Reliable Hyundai, a resident dealership with a fine selection of Hyundai models. It's critical to make a responsible choice when picking out a car, and we hope our 2018 Hyundai Santa Fe review helps you when it comes to this. We have a lot of Hyundai Santa Fe models for sale in Springfield, MO; stop by to be thankful for a test drive - setting up an appointment ahead of time is easy. Also, preceding your visit, you can see its stylish cabin from all ends by checking out our video walk-around.